“The pipeline will split our farm in half, and in reality it could kill us and our family because the pipeline will be about 700-feet behind our house”, says Tom Lovett, an Impacted Landowner. As a Brooks County, Georgia landowner who would be directly affected by Sabal Trail Transmission, LLC’s proposed pipeline, I adamantly oppose this proposed pipeline, for the reasons stated below. Follow the link for his reasons. “I understand why the landowners are upset. I mean I really do. I see that they don’t have answers right now, but it just takes time”, said Susan Waller, VP of Stakeholder Outreach for Sabal Trail Transmissions. Here’s video of Ms. Waller refusing to acknowledge Spectra’s sorry safety record until someone showed her a printed list of incidents of corrosion from PHMSA, the Pipeline & Hazardous Materials Agency (PHMSA). And that’s just the tip of the iceberg of Spectra’s safety violations if you also look at U.S. DOT’s NTSB, EPA, the Commonwealth of Pennsylvania, etc. Here’s video of Ms. Waller refusing to answer a question she just asked to hear. Here’s video of Spectra’s Director of Stakeholder Outreach Andrea Grover refusing to reveal the list of affected landowners. And I can attest from last night at Sabal Trail’s Jasper, FL Open House that Sabal Trail continues to refuse to acknowledge its sad safety record or to answer important questions. Protestors say Sabal Trail has had plenty of time, but a pipeline still isn’t a safe option for the area, one reason: active karst topography, or sinkholes. “Scientifically speaking, constructing a pipeline through an area that has active karst topogrophy is insane. From the point of view of an individual who has an interest in sustainability, still betting on fossil fuels, as much as the profits may be handy for some, is not forward looking, we have better options, we have safer options, we have cleaner options”, says Dr. Michael Noll, a Geographer and President of Wiregrass Activists for Clean Energy. 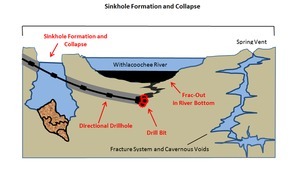 See for example Sinkhole formation and collapse due to drilling under the Withlacoochee River in Hydrogeology Report: Sabal Trail methane pipeline crossing of Withlacoochee River by David Brown. Sabal Trail proses to use horizontal directional drilling or HDD under these rivers, which already have springs, sinkholes, and caves in copious fracture systems. What happens if the drill bit encounters one or more of those? Potentially sinkhole formation, or collapse into an underground cavern. Such a hydrofracture, or frac-out would form a hole from the surface into the Floridan Aquifer, which is the source of all our drinking water. 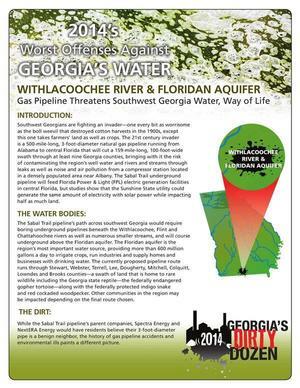 See also the WWALS Watershed Coalition item #9 in the Georgia Water Coalition Dirty Dozen, pubilshed today, Sabal Trail pipeline threatens Withlacoochee River and Floridan Aquifer.